What do you do when it’s the middle of winter and the arctic vortex is blowing through town? 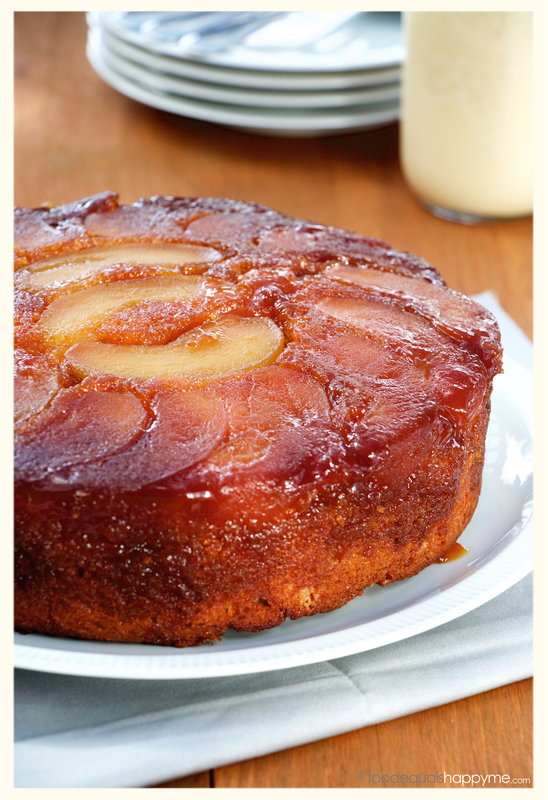 You stay home in the warmth and make a Caramel Apple Upside Down Cake with Creme Anglaise that’s what! Winter is hand’s down my least favourite season, I hate being cold! But the one and only redeeming feature for winter is the food. Hearty stews & curries, warm & gooey puddings, it really is the one good thing about the colder months. 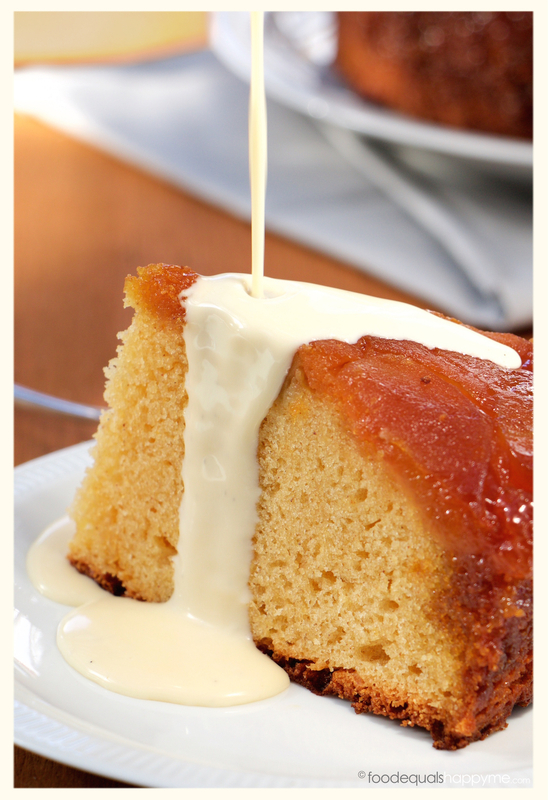 This cake is the perfect afternoon tea for those cooler days. 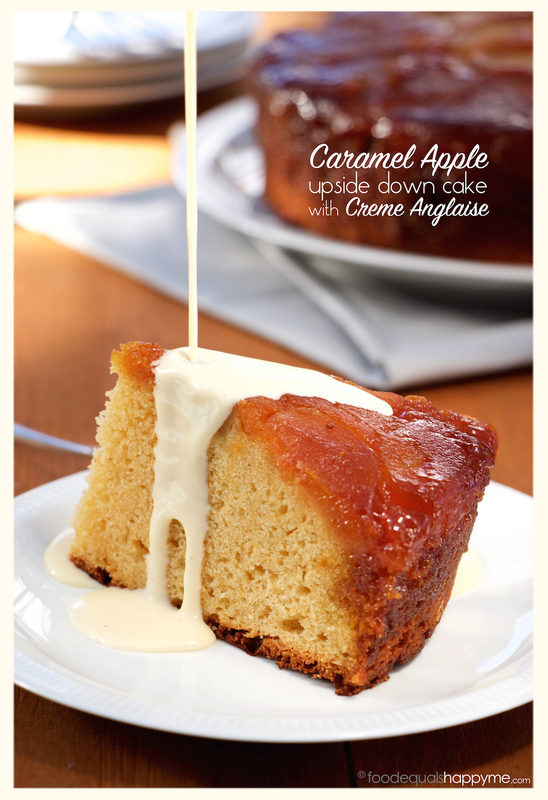 A warm layer of gooey caramel covered soft apples, sitting proudly atop a beautiful cake, served with lashings of sweet vanilla flecked creme anglaise, the perfect accompaniment. Preheat the oven to 180 degrees celcius. Grease a 20cm cake tin and place on a baking tray lined with baking paper. Peel and core the apples, and cut each one into eighths. 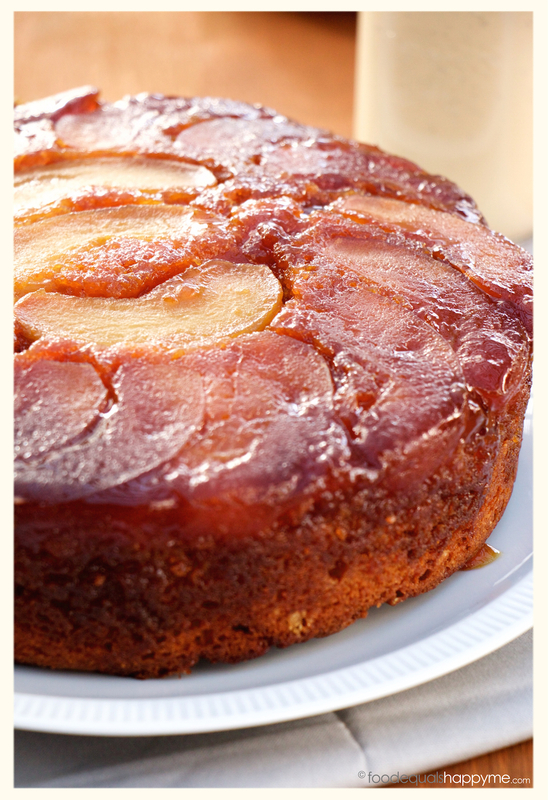 Neatly arrange the apples in the bottom of the cake tin. Place the water, lemon juice, sugar and half the butter (60g) in a small saucepan over a med-high heat. Bring to a boil without stirring, and then boil for 7-8 minutes or until it has reached a rich caramel colour. Carefully pour the caramel over the apples in the cake tin, trying to get an even coating over all the apples, then set it aside. In a mixing bowl place the remaining 60g of butter, brown sugar and caster sugar, and beat until well combined. Next add the egg yolks, sour cream and vanilla and beat well. Sift over the flour, baking powder, cinnamon, and salt, and then stir through until just combined. In a separate bowl whisk the egg whites until soft peaks form. Carefully fold through the egg whites in two batches, until just combined. Pour the mixture into the cake tin, and smooth the surface. Cook in preheated oven for 50mins or until the cake is cooked when tested with a skewer. Leave the cake to cool in the tin for 30mins. After 30mins, run a knife around the edge of the cake tin, then place a serving plate over the top of the tin and invert to release the cake. 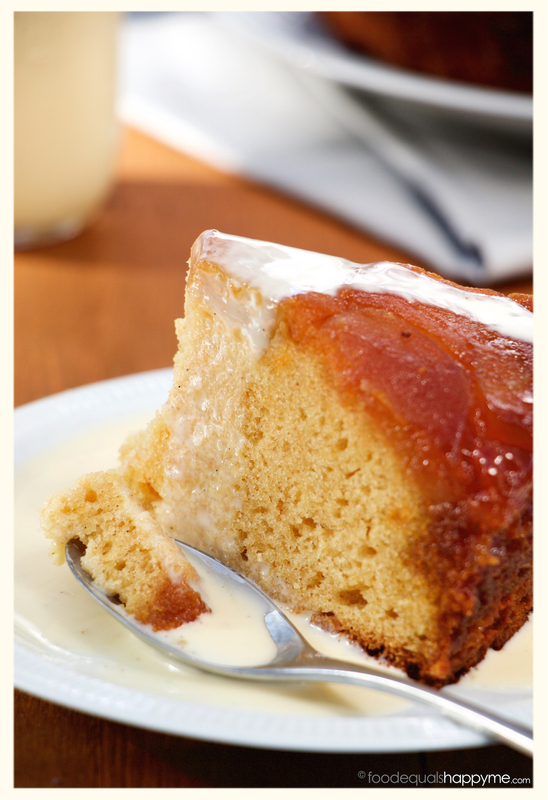 Serve the cake while still warm with generous lashings of creme anglaise. Place the milk and cream in a saucepan over a medium heat. Split the vanilla bean and scrape out the seeds, add both the seeds and pod to the saucepan. Heat the mixture until it just comes to a boil. Just before the cream mixture is about to boil, place your egg yolks and sugar in a mixing bowl, and whisk until they are thick and pale in colour (note – don’t add the sugar to your egg yolks until you are ready to whisk, as the sugar can burn the egg yolks). 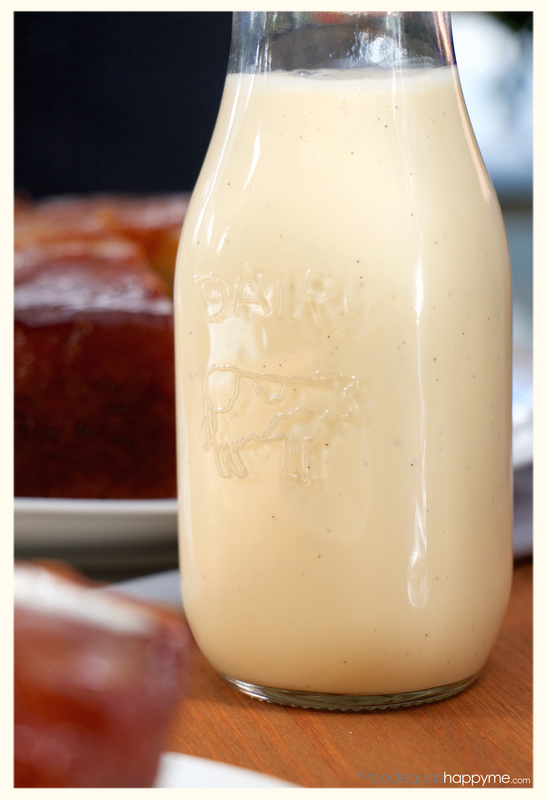 Slowly add the hot cream to the egg yolk mixture, whisking continuously as you pour it in. Once combined, pour the mixture back into the saucepan. Change over to a wooden spoon, and continue to stir over a medium heat for 5-7mins or until the mixture has thickened slightly, and coats the back of a wooden spoon. Strain the mixture into a bowl, and set that over another bowl filled with ice to cool it down. Once cool enough you can pop it into the fridge until ready to use. Gorgeous! It’s 100 degrees where I live but I’d still eat this cake!! !